Karen Mishra, professor of business, was seeking a way to help her management and communication/critical thinking students develop and express their creativity and collaboration skills. She found it in a Lego Serious PlayR workshop led by Wilson, NC-based facilitator Megan Oteri. 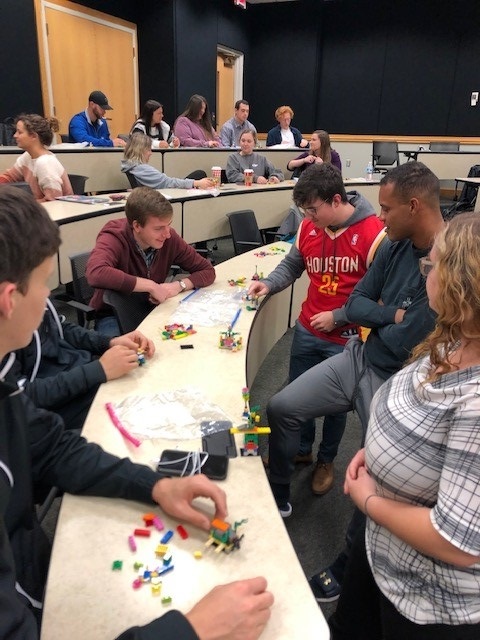 Certified to lead Lego Serious PlayR workshops for students and businesses, Oteri’s firm, Brick Scholars, offers creativity and STEAM workshops for K-12 in schools, camps and community programs. She also provides professional development programs, including team building activities that help team members develop a spirit of creative play in order to improve collaboration and communication, increase employee engagement, and innovate solutions while developing employee’s soft skills. Mishra is leading the fall 2018 communications course for Campbell’s BB&T Business Fellows, and is the co-author of the book “Becoming a Trustworthy Leader.” Learn more about Brick Scholars at https://www.brickscholars.com.